Which room in your house seems to get the messiest the fastest? The answer in my house – the kitchen. 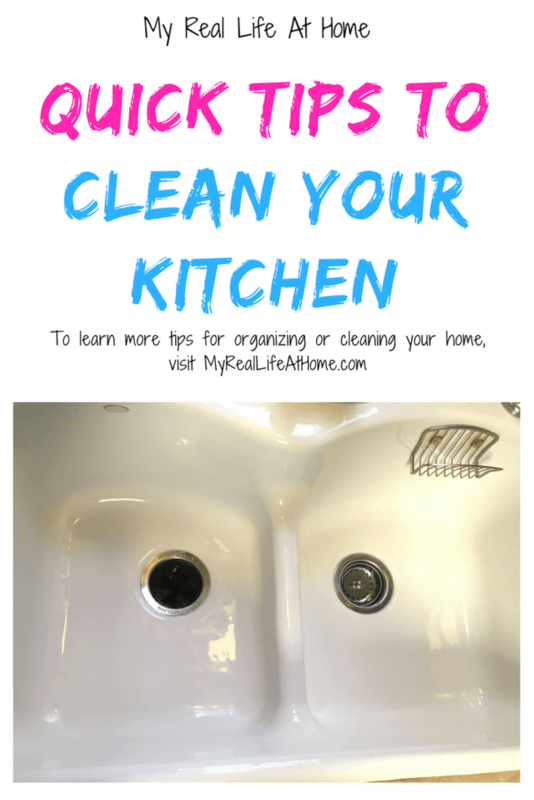 As a mom who struggles with a constant kitchen mess, here are some of the best kitchen cleaning tips I have learned. Obviously, this isn’t an exhaustive list but a few quick kitchen cleaning tips to get us started. Can you relate to this? Hopefully, it isn’t just me! Let me start by saying, I love my kids! My family is my main priority but if you have children, maybe you can also relate to this. In my house, every sip of water needs a new cup even if the last sip was 5 minutes ago. And yet, I want a clean kitchen. It always makes me less stressed to see that sparkling sink or the clutter free counter. As I challenge myself this year to have a cleaner, more organized home, this is one of my main areas to tackle. One of my goals is to have a clean sink every night before I go to bed. I find it much harder to start my day off right when I come down to a sink full of dishes. I have an immediate slouch of my shoulders as I try to get breakfast for the kids and make lunches, all while trying to avoid yesterday’s dishes. If you can do some continual cleaning throughout the day, it shouldn’t be a big cleaning task to have a sparkling sink. Most nights it will be a quick wipe down of the sink and should take a minute or less. Whether it’s a dishcloth or disposable wipes, find something that works for you and just start! 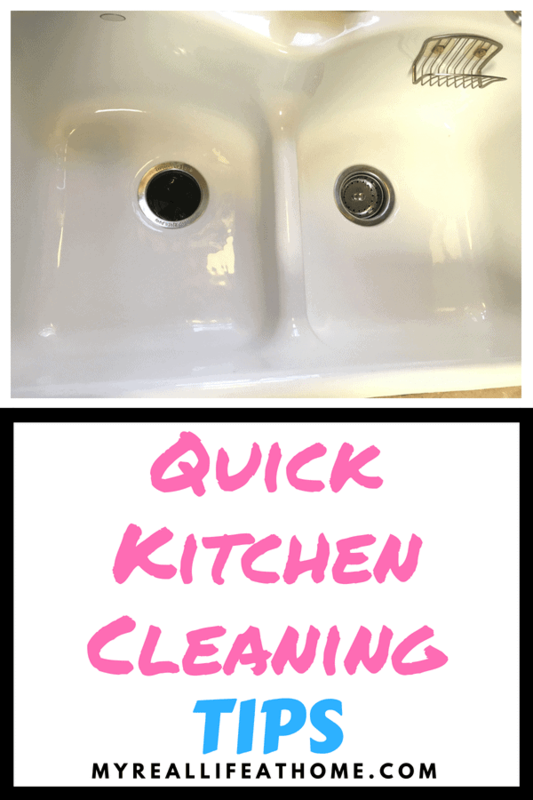 If your sink needs a little more than just a quick wipe, I love using Bar Keepers Friend. You can usually pick it up at your local grocery store or order it from Amazon. We have a white porcelain sink that is constantly getting marked up from pots and pans. Bar Keepers Friend is a lifesaver! 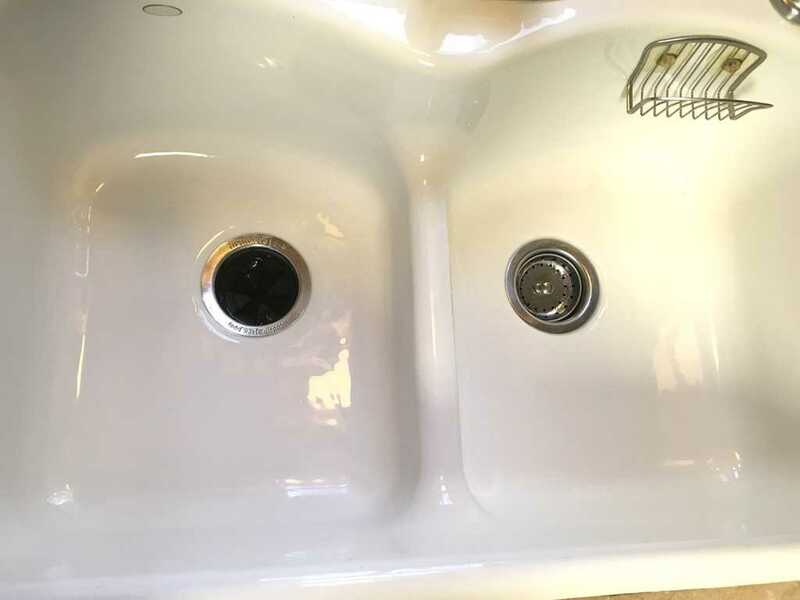 A quick sprinkle and wipe and the sink is back to a clean, sparkling white. It looks so good, I struggle to put anything in the sink so I don’t mess it up! 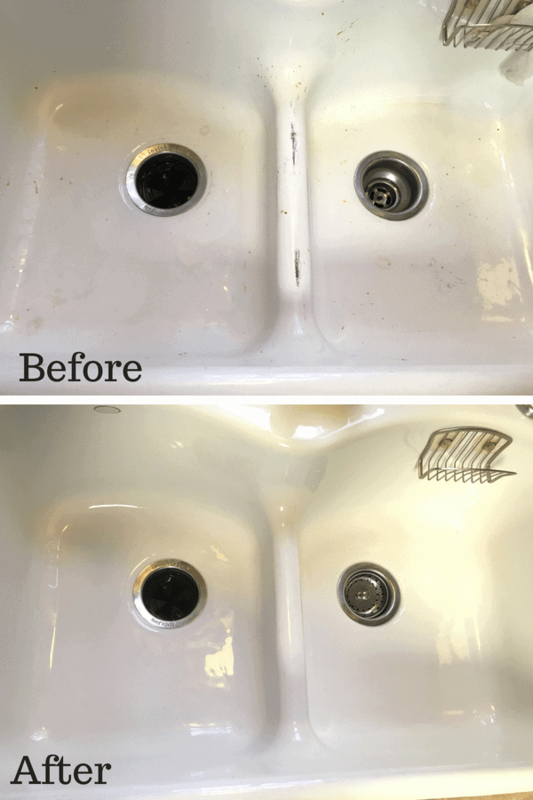 I have already mentioned Bar Keepers Friend for cleaning the sink, but I also have great results with it for cleaning my stove top. I have a glass stove top and when something boils or spills over, it is a pain to clean. It burns on to the stove top and can be very difficult to clean. Someone recommended Bar Keepers Friend for this as well. Just wet the stovetop and sprinkle on some cleaner, let it sit for less than a minutes and wipe off. Full disclosure, some stains will still need a lot of elbow grease but most of the stains come off quickly. I also use Mr. Clean Magic Erasers or other versions of that product. 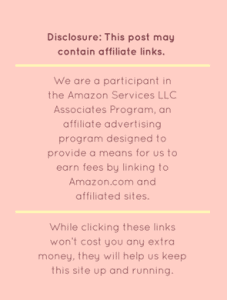 You can usually buy them at Walmart or Target or your local store or on Amazon. They work great for stains. Every time we have Chinese food, sweet and sour sauce somehow always makes it to the counter and leaves an orange mark. Wet the eraser, wring it out, wipe off and the sauce stain is gone! It also works great on the floor for scuff marks, however, it can take the sheen off so you may want to do a test area first. I have also used the Magic Eraser to remove baked on grease from baking sheets. 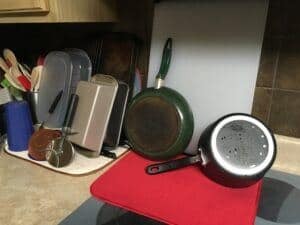 Another product I love in my kitchen is my dish drying mats. You can get all different sizes and patterns to suit your needs and taste. Personally, I hand wash my knives, pots, pats, etc so I am constantly using these mats. I let my dishes air dry on these mats. The great part is that the dish drying mats are more absorbent and dry faster than a regular towel. They are very inexpensive and when they get dirty, I just throw them in the wash. I also love my oven liner. It is made of a non-stick material and you simply place it in the bottom of your oven (under the element). You may need to cut it to fit your oven perfectly. I love it because they are so easy to clean! When food spills over, instead of it burning on the bottom of your oven, the liner will catch everything. The best part is the ease of cleaning. Simply take it out of the oven and wash it off with warm water. Let it dry and put it back in the oven and you are done! I personally use washable dish clothes and sponges for my hand wash dishes but at times I wonder about germs. It’s easy to throw the washable cloth in the wash but what about the sponge? A great way to sterilize your dishcloth or sponge is to wet it and while it’s wet, microwave for 2 minutes at full power. A couple things to know – be careful when removing the sponge from the microwave, it will be very hot. Also, don’t microwave any sponges or plastic scrubbers that contain steel or other metals. Obviously use common sense, if the sponge really stinks or is falling apart, it is probably time to just toss it and get a new one. There is also a great side benefit of this cleaning trick. When you remove your sponge, you have already started cleaning your microwave. The steam will help soften and loosen any baked on grime so just grab a cloth and wipe. 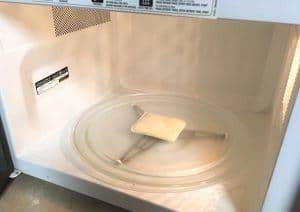 If you don’t need to zap your sponge but want to clean your microwave, try this quick microwave cleaning trick. Mix equal parts of water and vinegar and place a wooden toothpick, popsicle stick or something similar in with it. (The wooden object will help avoid the small chance of bubbles forming rapidly and causing an exploding liquid that is dangerously hot). Microwave for 5 minutes and then let it sit for a minute or two. It will be very hot, so handle with oven mitts. Grab a sponge or rag and wipe down. Voila! You should be done! In reality, it only takes a few minutes, since you can be doing something else while the microwave is doing its thing. 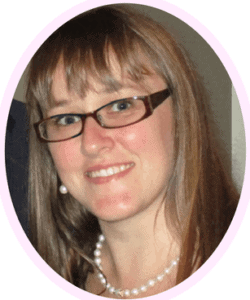 Although I personally don’t use natural products, everywhere that I look Puracy products have great reviews. Their Natural All Purpose Cleaner is an Amazon’s Choice and it rates 4.5 out of 5 stars. 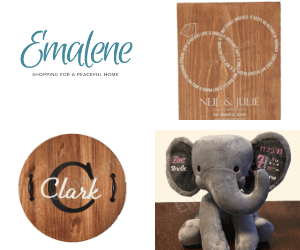 They have different product lines including Household, Baby and Personal Care. I am hoping you read this and thought “that’s not so hard” and guess what? You’re right! These quick kitchen cleaning tips are just an easy start to get you going in the right direction. And again, you can’t finish if you don’t start. I would love to hear your thoughts or ideas below. If you have any questions, please leave them in the comment section and I will be happy to answer them. Magic eraser is truly magic. My sink has to be cleaned after doing dishes or I’m not done in the kitchen. I can’t believe how many times and places I have used the Magic Eraser. I know there are more uses for Barkeepers Friend but I haven’t experimented with that much yet. What else do you use it for? Thanks for sharing your tips, my kitchen seems like a never ending project just to get a clean! I think most of us are in the same situation! 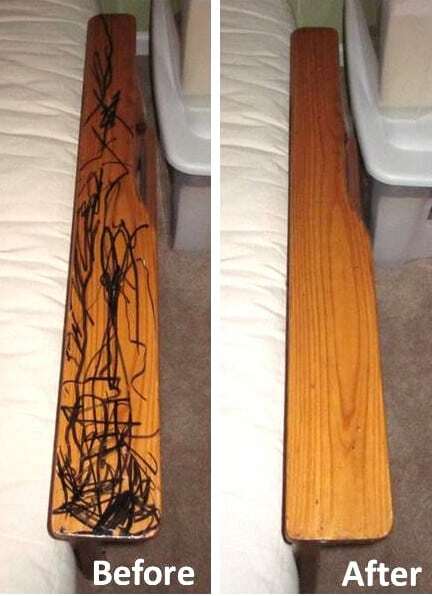 Oh yes, my children are VERY artistic. lol I love the magic erasers! Will definitely have to check out the bar keepers friend! Waking up to a dirty house is the worst! I always try to make sure it’s clean before bed. Oh and I love my drying mat as well! It’s amazing how my mindset starts in the morning based on how clean or dirty the house is. Glad I was able to help. I’m also learning that baking soda and vinegar can clean so many things. We love our drying mat too! I am guilty of washing dishes and just leaving them there to dry. Then I will put them away from they’re all dry. I feel like my drying mats never leave my counter. Even though we have a dishwasher it seems like I am hand washing dishes every day. By the time they air dry and I put them away, it is time to use the mats again! I have wanted to try the lemon time in the past but I rarely have lemons in the house 🙂 I’m sure it would smell great. I love the clean smell of a lemon. All of these tips are wonderful and will come in handy. I don’t use sponges just heard about the germs they keep. I use rags and just wash them so I know they are clean and ready for use again. Rags are a great idea too. I love anything I can throw in the wash to clean them. 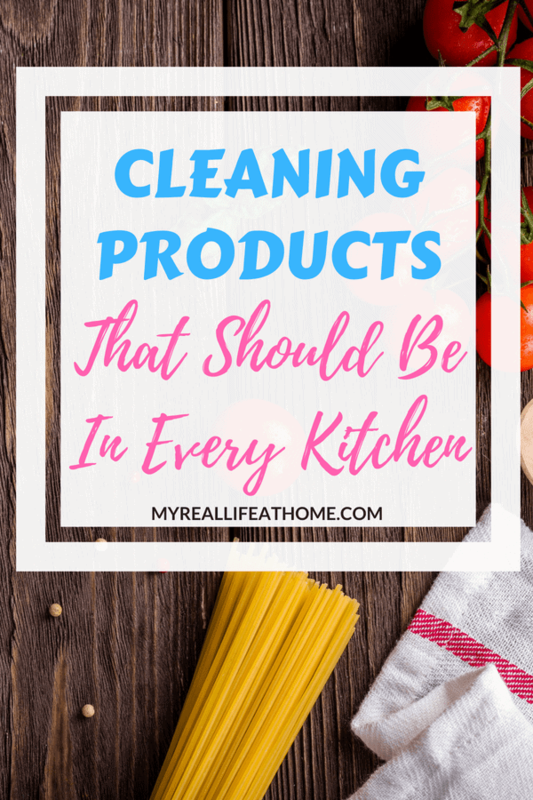 Thanks for sharing some tips to help keep the kitchen and house clean. I will certainly try some of them! 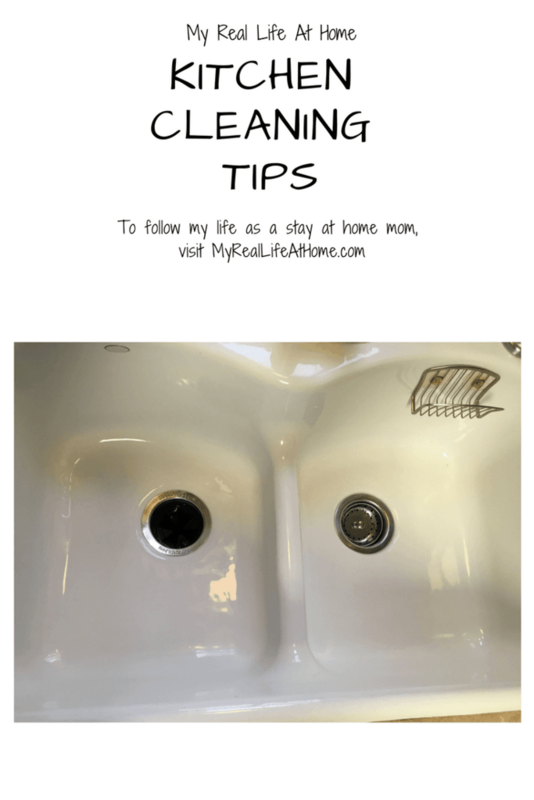 I would love to hear what cleaning tips you try and how they worked out for you. Isn’t it amazing what that magic eraser can do!? My counters have a fixed drying mat on it. Love them! It’s crazy how well the magic eraser works. I don’t know how it works so well but I don’t really care! 😀 I have them all over our house. Thank you for these simple tips and indeed they are all doeable! I prefer to use natural products like lemon and vinager but I also used dettol and chlorine as I have 2 husky dogs and need my house to be as germ free as possible. Vinegar is such a great cleaner. I use it to clean in my bathroom a lot. That sounds like my house. When the kids are home from school, there is more mess and dishes. These products definitely help. The magic eraser really is amazing!! Absolutely! I have multiple throughout my house. I didn’t know about cleaning the sponge in a microwave. That is a good trick, and it helps clean the microwave. Cool! I use BarKeeper’s Friend on pans but never thought to use it on the sink! Great idea! I actually just finished cleaning my sink with it and am always amazed how well it works. I have never used it on pans though. I will have to try that.